Newswise (03/29/07) — Recent controversy has surfaced regarding the efficacy of soy protein consumption in reducing serum cholesterol. Of primary concern is whether a 1995 meta-analysis (which generated considerable excitement in the medical community) accurately estimated the impact of soy consumption on cholesterol lowering. Following are the facts you should know about soy and heart health. A 2006 American Heart Association (AHA) research review found that soy protein lowers blood cholesterol above and beyond that realized from a low fat, low cholesterol diet. This finding is consistent with the U.S. Food and Drug Administration (FDA) recognizing that soy protein lowers cholesterol by between 3 and 8 percent. The AHA report noted that soy foods are heart healthy because of their high content of polyunsaturated fats, fiber, vitamins, minerals and low content of saturated fat, making them an ideal substitute for less healthy foods that are high in saturated fat and cholesterol. The FDA and, similarly, the AHA have agreed that soy foods appear to modestly lower triglycerides and raise HDL (“Good”) blood cholesterol levels. Authorities around the world have approved health claims supporting the consumption of soy protein and a lowering of blood cholesterol, including the USA, Korea, Japan, Brazil, Philippines, Indonesia, Malaysia and the United Kingdom. These claims were approved based on an extensive review of scientific literature to determine that the relationship between soy protein and lowered cholesterol was well established. It’s the weight of this scientific evidence that led so many government health authorities to approve soy/heart health claims. Soy foods have the unique ability to both lower LDL (“Bad”) cholesterol and lower triglycerides, but not to the degree expected from cholesterol-lowering medications. That soy products have been found to lower blood cholesterol even a small amount, however, has the potential to dramatically impact public health. One may argue whether a 3 – 8 percent reduction in cholesterol is “clinically significant,” but the bottom line is that heart disease prevention depends on small life changes. Neither pharmaceuticals nor soy foods are by themselves panaceas for a healthy heart. NEWSWISE (03/28/07) -- For several years, our laboratories have studied the ability of freeze-dried berries (black raspberries, strawberries and blackberries) to inhibit cancer in the esophagus, colon and oral cavity. Berries contain a number of agents that prevent cancer including vitamins A, C, and E; calcium and selenium; ß-carotene, α-carotene and lutein; and many phenolic compounds which have high anti-oxidant potential. The most abundant phenols are the anthocyanins which give berries their color. 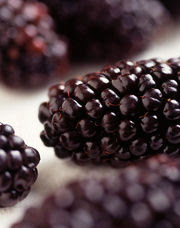 In general, dark berries have higher contents of anthocyanins and anti-oxidant potential than light berries. The addition of powdered berries at 5 and 10% of the diet of animals reduces their risk for development of cancer in the oral cavity, esophagus and colon by 45-80%. Berries function to reduce the amount of genetic (DNA) damage produced in these tissues by chemical carcinogens, including carcinogens in tobacco smoke and in the diet. They also reduce the growth rate of precancerous cells, in part, by reducing the expression of genes associated with cell growth. Berries also inhibit the expression of other genes associated with cancer development including genes involved in inflammatory processes and in the formation of new blood vessels (angiogenesis). In a preliminary trial in humans, berries were found to be well tolerated at doses similar to those used in animals. They reduced cellular damage caused by oxidative radicals which is consistent with their anti-oxidant potential. In view of these results, several human clinical trials are ongoing to determine the ability of freeze-dried berries to inhibit the development of precancerous lesions in the oral cavity, esophagus and colon of humans. Preliminary results suggest that berries influence the expression of many of the same genes in humans as they do in animals. An apparent advantage of this “food-based” approach to disease prevention is the relative absence of toxicity associated with the long-term consumption of berries by humans. Few American men have heard of the pomegranate, and fewer still have eaten this curious-looking fruit loaded with red seeds. But new scientific findings suggest that pomegranates may one day find a place in healthful diets, reports the April 2007 issue of Harvard Men’s Health Watch. Two recent studies suggest that pomegranate juice may help fight prostate cancer. In one study, scientists grew cells from highly aggressive cases of human prostate cancer in tissue cultures. 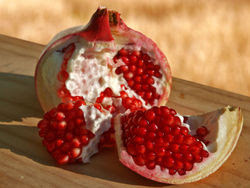 Pomegranate fruit extracts slowed the growth of the cultured cancer cells and promoted cell death. The researchers then implanted the cancer cells in mice. A group of mice that received water laced with pomegranate juice developed significantly smaller tumors than the untreated animals. In a preliminary study of men with prostate cancer, pomegranate juice lengthened patients’ PSA doubling time (the longer the doubling time, the slower the tumor is growing) from 15 months before treatment to 54 months on the juice. Seems like fiber is popping up in the most unlikely places recently -- fiber-enhanced orange juice, fiber-rich yogurt and now soymilk with fiber. Silk brand soymilk recently released a vanilla flavored soymilk with five grams of fiber per serving. It's a convenient way to boose your fiber intake while enjoying your favorite breakfast cereal or smoothie. The Silk Web site reminds us that "fiber is a nutrient vital for health and well-being. It adds bulk to your diet and encourages healthy digestion by aiding in elimination and helping to maintain proper pH levels in the digestive tract. Fiber has also been shown to help promote healthy cholesterol levels." I don't think too many vegetarians are lackly in fiber. And this "special" Silk cost nearly a $1.00 when I purchased some last week. I used it for smoothies and it tasted great -- pretty much like other Silk vanilla flavors. So unless you feel like you need some extra fiber, don't spend the extra money. For those veg-heads who need a bit more fiber action, check out this new product. March weather calls for soup but it's the time of year when we are ready for some new tastes and flavors. In my part of the world, new potatoes and asparagus are beginning to show up in the market. 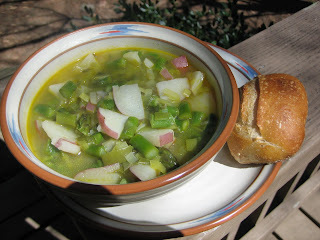 This quick and easy soup makes quick use of these wonderful spring vegetables. Leftovers keep well -- and in fact get better with age. 1. In a large stockpot, heat olive oil over medium heat. Add leeks and cook until soft -- about 5 minutes. 2. Add stock, potatoes, thyme, salt and pepper. Cover and cook and simmer over medium-low heat for 20-30 minutes or until potatoes are fork-tender. 3. Add asaparagus. Cover and cook 5 minutes. 4. Adjust salt and serve hot. I really like Clif Bars' line of Luna bars -- these tasty vegan treats are expensive but are terrific when you need a snack that can travel well. The company's newest offering is the Luna Tea Cakes. These nutrition bars look and taste more like a soft cookie. The cakes combine Clif Bars' typical organic ingredients, vitamins and minerals with tea from the Republic of Tea and innovative additions like pomegrante puree and goji berries. They taste great and are superb with a mug of complimenting tea or a tall, cold glass of soymilk. You'll definitely want to check them out -- if you can find them. I've been able to purchase Luna Tea Cakes at only one store in town. My home town of Asheville is a veggie mecca. And just this week a great local firm helped make that point: Asheville's own Tree Huggin' Treats won "Best of Show" in the vegetarian products category at Expo West in Anaheim, Calif. Their organic, vegan Crispy Cat candy bar won the hearts of the 45,000 attendees and 2,500 exhibitors. The award was presented by San Francisco-based VegNews magazine, which will feature the company and its dark chocolate over crispy rice confection in its next issue. Crispy Cat comes in mint coconut, roasted peanut and toasted almond flavors. Mad props to Joel Scahnt, Tree Huggin' Treats founder, and the rest of his crew! Sorry for the blogging hiatus... life gets busy sometimes! But I'm back and ready to spread some veggie news, interviews and recipes to you loyal readers.